Our four stores have everything you need to keep your home, business, and lawn in great shape throughout all of our beautiful Wisconsin seasons. We sell ice melt in bags from five pounds to fifty pounds. We also have solar salt (water softener salt) in crystals and pellets. In case you have large area to salt, you can purchase some of our ice melt and solar salt by the pallet. If you want something safe for you pets, we sell that too. We sell snow blowers and snow tractors. We also have a variety of shovels and snow brushes. Be sure to check out our monthly flyers all winter long to get the best deal on winter weather supplies. We sell a few different kinds of wood pellets in fifty pound bags. These can also be bought by the pallet. We also have barn lime and sand bags, which will give you both traction and some helpful weight in the back of your truck. To make the winter season more fun, we also have a variety of sleds and snow tubes. Shop Ace's winter essentials here. For the Christmas season, we sell Christmas trees, lights, wreaths, and much more! Walsh's Ace is a great place to buy your holiday decorations because you can also be sure to get the right wall hooks, extensions cords, and timers to make sure your decorations are in perfect working order. You can view the Christmas lights and decor we sell here. In the spring, we sell a wide assortment of yard decorations, including solar lights, flags, wind chimes, and statuary. We have some patio furniture on hand, and if we don't have what you're looking for, we'd be happy to order it for you! You can view the spring and summer yard decor we sell here. Whether you've been making maple syrup for years or you're just starting this year, we have the supplies and tips you need to make this a successful tree-tapping season. 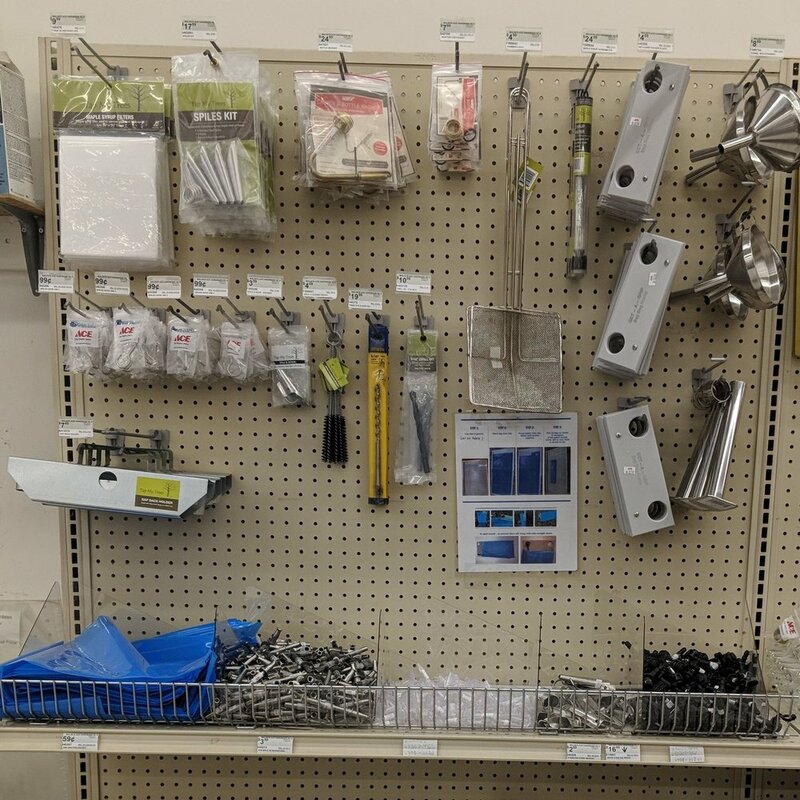 We sell different styles of spiles, buckets, filters, hydrometers, skimmer ladles, and more! If you have questions about tapping or making syrup, we would love to help you! When it comes to grilling, we sell everything but the meat. We have a huge variety of grills: gas, charcoal, electric, smokers, and fryers. We sell grill covers, replacement parts, and grill cleaners. We sell a lot of different grilling utensils and cookware. We have charcoal, wood pellets, and flavorizer chips. We also have lighters, and lighter fluid. Then, to perfect your grilling experience, we sell BBQ sauces and seasoning. You can see some of the grills we sell here. If you want a healthy, weed-free yard, we're here to help! We sell grass seed, fertilizers, and fertilizer spreaders. We also have weed killers to defeat even the stubbornest weeds. We sell products by Roundup, Ortho, Preen, Spectracide, Scotts, Bonide, Bayer, Whitney Farms, and more. For fall yard cleanup, we have rakes and lawn and leaf bags. For information about our gardening supplies or insecticide, see Lawn and Garden.